Out of Synch is a project that looks at the synchronisation of design elements and the effect of breaking that synchronisation so that these elements move in and out of alignment. The project does not focus on one particular weaving style or technique, so rather than describing the different techniques used in any detail, I will focus on the nature of the Out of Synch approach and how I have applied it to various styles of weaving. The main approach I have used takes two independent repeating sequences and ensures that the length of the repeat of one is longer than the repeat of the other. The effect of this is that the two sequences go in and out of alignment. This approach can be applied in a number of ways. The simplest example is this piece. Here, each stripe has three independent components: the width of the stripe, the weave structure of the stripe and the colour of the stripe. ​If the repeat for each component were the same, say five, then a simple sequence of five stripe widths, five structures and five colours would give an overall repeat of just five stripes. In my version, the repeats are different: there are three stripe widths, four structures and five colours with an overall repeat of 3 x 4 x 5 = 60 stripes. 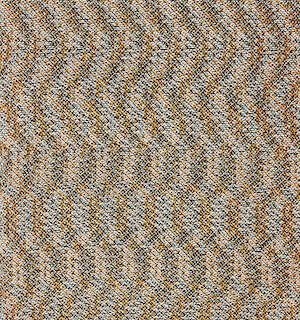 ​In practice, the textile is less than 60 stripes high so the pattern actually never repeats. 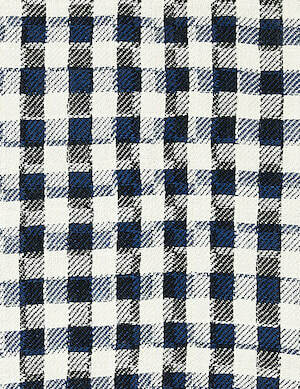 This check design uses bold contrasting stripes in warp and weft. 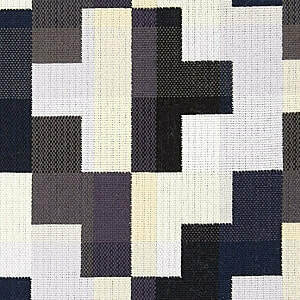 Conventionally, the colour stripes would synchronise with the block structure of the weave so that, for example, the dark areas can be woven with one weave structure and the light areas with a different one. 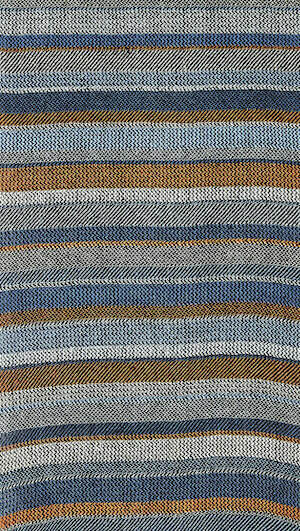 ​In my version the colour stripes are wider than the block structure, so the weave structures are not in synch. with the colours, giving a more complex pattern. I’ve applied the same idea to a double cloth structure here. One layer of cloth uses four dark colours and the other uses three light colours. ​The stripes in each layer are wider than the block structure of the double cloth so the colour changes do not always occur at a block boundary (both horizontally and vertically) adding subtle complexity to the design. Here the lack of synchronisation is much more obvious. 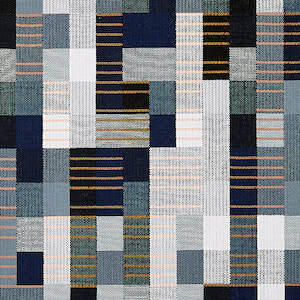 ​The main block structure of the double cloth, woven in shades of blue and grey, is out of synch. with the horizontal orange bars. This design element appears to travel up the cloth independently of the main block structure. This design harks back to my previous project When Waves Collide. 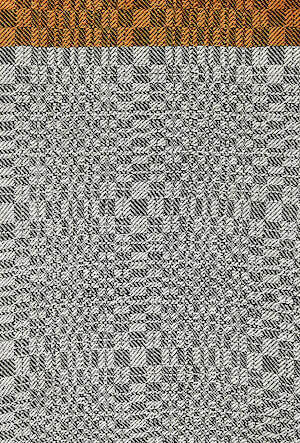 Here there are two interleaved waveforms woven into the fabric. ​The two waves have different wavelengths so, once again, they are not synchronised, but move in and out of alignment vertically through the textile. The second approach I have taken is one that can be applied to a single sequence. I think of it as “skipping a beat”, similar to a cog with a broken tooth that slips on each turn. Here a simple repeating sequence such as ABCD, ABCD … is replaced with one that slips regularly ABCD -BCD A-CD AB-D ABC- … (in this case, missing every fifth element) giving a new longer sequence: ABCD BCDA CDAB DABC. In this piece I have used this approach to disrupt the block threading. In my version the sequence misses every 9th beat, so that it becomes 1-8, 10-1, 3-10, 12-3… resulting in a much longer repeat. Using the same principle for the lifting sequences this produces a much more complex pattern. The examples I have given here apply the idea of a slipping sequence to the threading order and the sequence of lifts during weaving, but it can be applied to any sequence. ​Elsewhere, for example, I have used it to create a colour sequence for a four-colour stripe. I hope I have shown that, although these are simple ideas, they have a substantial effect when applied to a range of weave structures. These are just examples though: there are other variations of both approaches that could be explored, and many other weaving designs and techniques that they could be applied to.